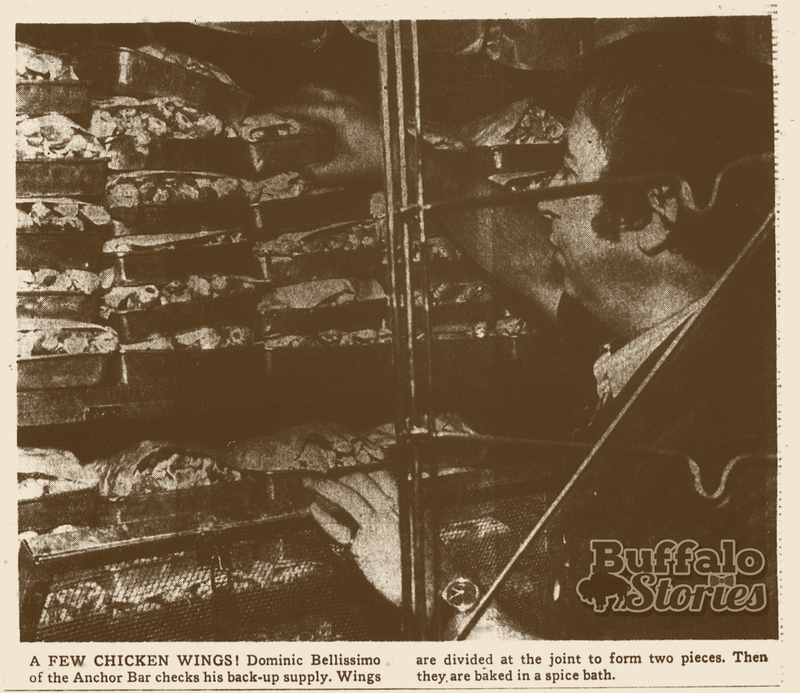 We’re searching out the history of the chicken wing in this, the 50th anniversary year of Buffalo’s most famous eponymous bar food. Looking under “Pizza” in the yellow pages of Buffalo’s 1969 Telephone Directory, only one restaurant — the Anchor Bar — lists “chicken wings” as a menu option in its ad. That isn’t to say that others weren’t selling wings — in fact, several listings do mention “chicken” — but the Anchor Bar was alone in hawking “chicken wings” as such. Though there are other versions of where wings came from, the legend goes that the modern “Buffalo chicken wing” was invented at Buffalo’s Anchor Bar in 1964. The fact that the Anchor Bar is the sole promoter of the chicken wing on the pages of the phone book four years later may bolster that claim. But not so fast, might a chicken wing conspiracy theorist say. With that same 1969 phone book in hand, one could point out that in the “Restaurant” section, while the Anchor Bar’s ad makes mention of music and Italian specialties, there is no mention of chicken wings. When you flip a few pages forward, you find the only mention of wings in the restaurant section: a small listing for “Wings & Things,” John Young’s Jefferson Avenue restaurant, which also claims a role in creating the icon of gastro-pop culture. 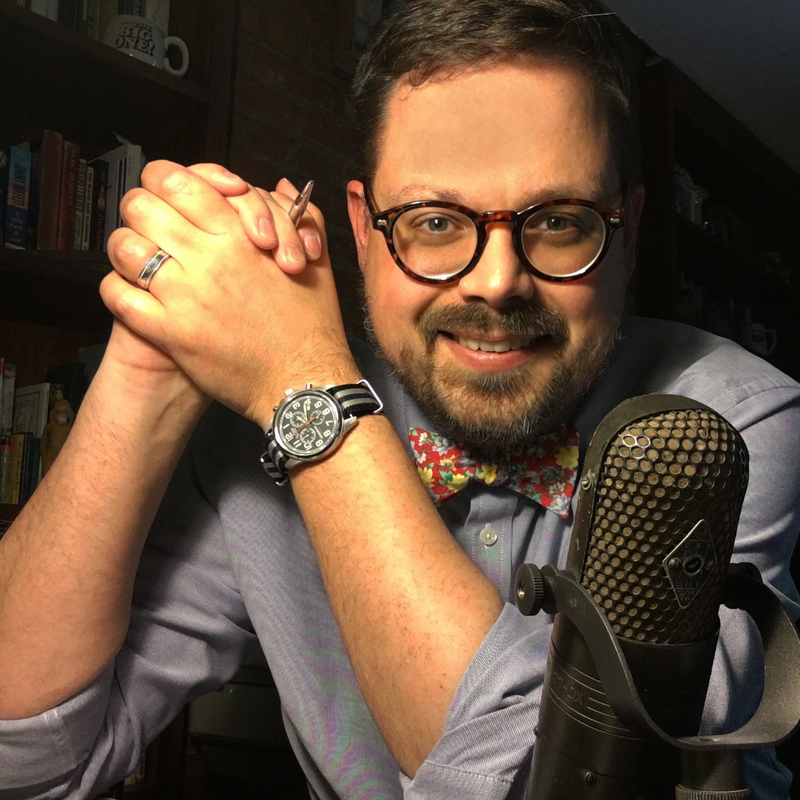 Add another four years, and by 1972, the wing world has exploded in popularity to the point where News Food Editor Janice Okun offered up a discussion of wing history, preparation and recipes for homemade wings and blue cheese dressing. Through the years, dozens of reporters have written hundreds of stories about chicken wings: summarizing the history of the wing, eating wings during Super Bowls, mailing wings to ex-pats, organizing festivals dedicated to wings. 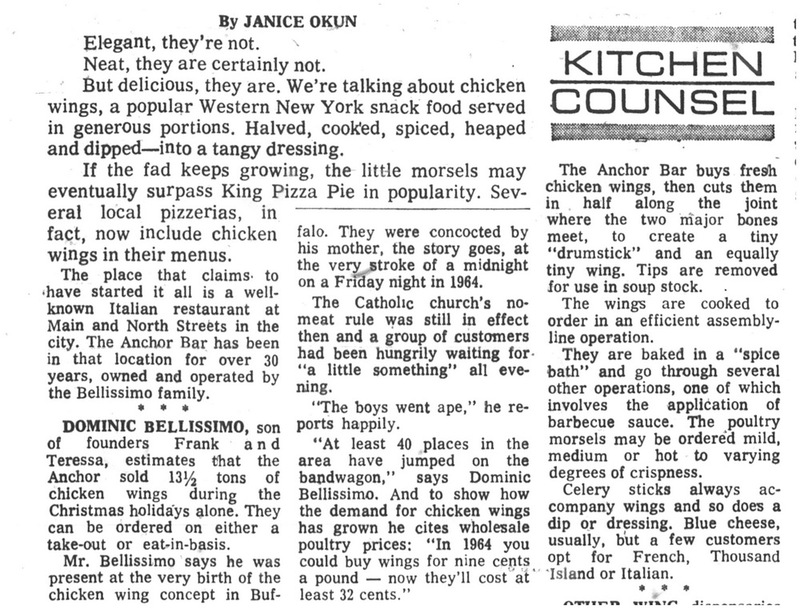 What follows is the first in-depth Buffalo newspaper story on the chicken wing, written eight years after that night in 1964 when Teressa Bellissimo made culinary history. “Neat, they are certainly not. “But delicious, they are. We’re talking about chicken wings, a popular Western New York snack food served in generous portions. Halved, cooked, spiced, heaped and dipped into tasty dressing.